Trip Description : The natural architect bizarre stone, Grand Father and Grand Mother Rock or called “Hin Ta – Hin Yai” in thai.Ancient Mumified Monk at Kunaram temple Nathon local Thai market and Town Namuang waterfall Big Buddha temple, the scenic Samui Buddhist temple located on the top of mountain. 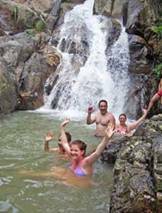 Trek on the back of the elephant through beautiful jungle & coconut plantations. an exciting enjoyable & unforgettable experience. 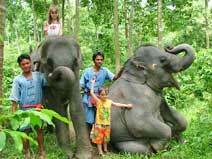 Which “Island Safari” amazing elephant show, you can even try special baby elephant massage! Also meet and feed the elephant a great photo opportunity. Meet our macaque monkey’s & watch how they are trained to pick coconut from the trees. We stop off at several of the islands best viewpoint, from this point you can see the white sandy of Chaweng beach. Stretching for about 7 km. along the eastern coast of Samui Island. You can enjoy amazing panoramic where view of Koh Samui the surrounding Island. The body of Samui’s most famous mummy field monk, He was sitting in meditation position. He is still in that some position and his body show signs of any major decay. Is 30 meters high and can be reached by vehicle. The water Fall are the most scenic on the Island. Nathon is the main port town for passenger ferries and cargo boats arriving from and leaving for the mainland and it is also Koh Samui’s administrative capital. The shopping here is also good, and often cheaper than on the big tourist beaches.